MOCAP Vinyl Plastic Plugs are perfect for shipping, masking and thread protectors. Use these plastic plugs to protect valves, pumps, cylinders, tubing and other applications. Flexible plastic plugs compress within holes to form a snug fit that keeps dust, debris and contaminants out. Plastic plugs have a wide flange for easy install and removal. Use MOCAP plastic plug as pipe plug, hole plug, masking plug or lower cost alternative to rubber plug. MOCAP round vinyl plastic plugs are available in sizes to fit 1/4" through 1-1/4" satndard threaded holes, M6 through M40 metric openings and 1/2 through 1 NPT openings. 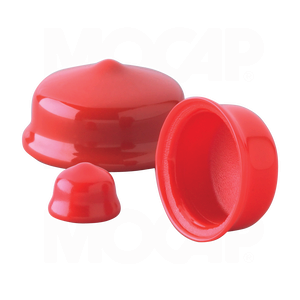 MOCAP vinyl plastic plugs are often used as inexpensive and disposable single use masking plugs for painting and coating processes under 100°C (212°F). For higher temperatures, consider our High Temperature Vinyl good to 230°C (446°F), EPDM Masking Products good to 149°C (300°F), or our Silicone Masking Products good to over 316°C (600°F).